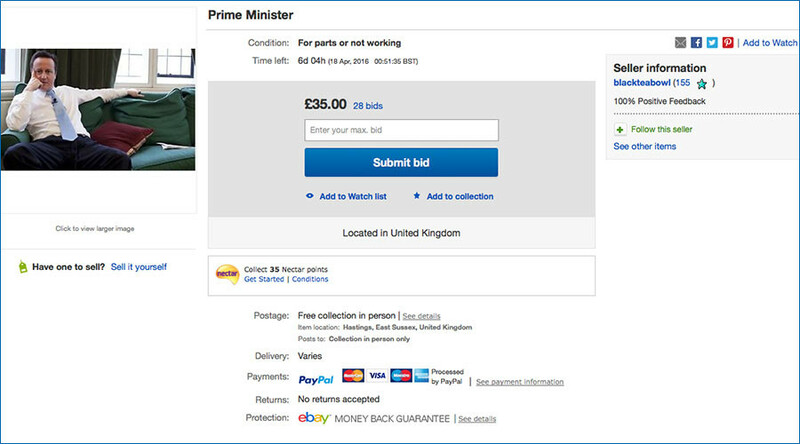 David Cameron, the British prime minister in the middle of the #PanamaPapers tax evasion scandal, was briefly up for auction on eBay by a hilarious seller this week. Listed in the ‘statues and ornaments’ section, “David Cameron” had a ‘Buy Now’ price of £65,900 (US$94,000) before the ad was removed from the site Tuesday. Unfortunately, the PM will not come with a box or instructions as the seller “is not prepared to touch” the product. Mr Ethical aka Nicholas Wilson, who posted the ad, is a whistleblower and corruption campaigner who revealed HSBC’s £1-billion fraud. The eBay auction was the latest blow for Cameron, who is facing calls to resign after the leaked Panama Papers revealed his family history of tax evasion and offshore accounting. A petition calling for his resignation has reached 144,045 signatures, more than the 100,000 minimum required for Parliament to debate the issue.